Cybersecurity is a complex topic which wholly depends on your environment. The true complixity is not revealed without thorough analysis. Such as: A Cloud environment is a different analysis than a local server connected on a DMZ that all employees access at home. Having your own servers managed by your employees is a different environment than outsourcing the environment. Both situations have their own analysis points. Ok, that was fun - Now let's get down to business. As in my post at Oversitesentry.com: How bad is it? Will Cybersecurity get worse? 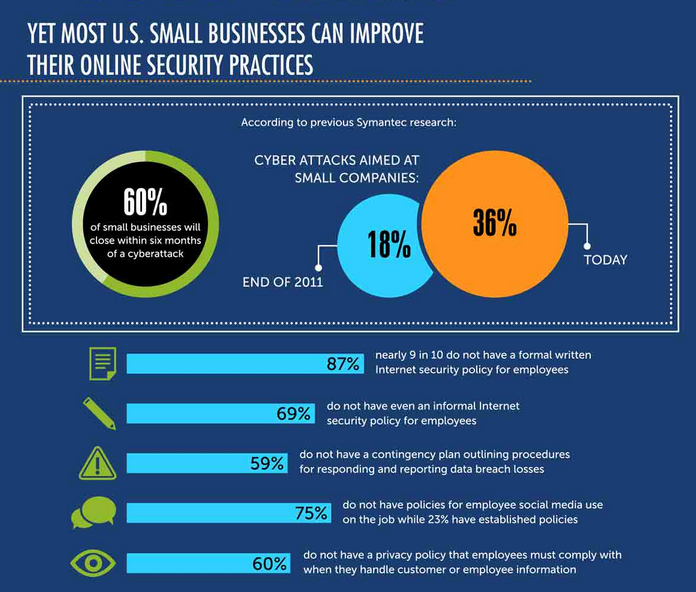 36% of all Cyber attacks are aimed at Small businesses due to the lax attitudes. Small business that receives a successful cyber attack, 60% go out of business in 6 months. 89% do not have a formal written Internet security policy for employees. 69% do not have an informal written Internet security policy for employees. 59% do not have a contingency plan outlining procedures for responding and reporting data breach losses. 75% do not have policies for social media use on the job while 23% have established policies. It is time that all companies have cybersecurity policies and procedures - get started now - Contact Us.